Credit to image used in pin goes to Aveda Corporation. – Changes were made to the original image. Summer is just around the corner and it’s that time again where heat and humidity are super high. And while you love the warmer temperatures perfect for outdoor activities or a quick beach visit, unfortunately, we all hate excessive sweating. 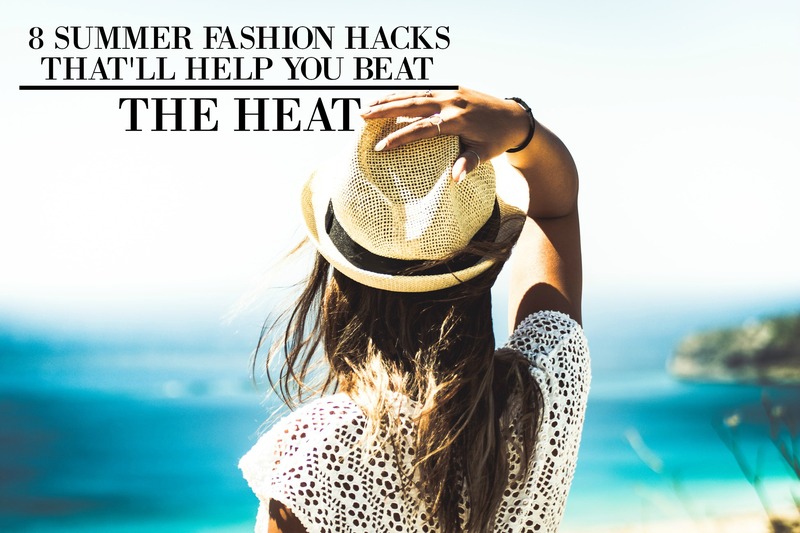 But thankfully, I’ve found down below some awesome summer fashion hacks that’ll help you survive summer while still looking stylish. These are style ideas that will help you feel comfortable and make you look fashionable. They’re the perfect summer outfit ideas that you might want to try. So check them out below and let me know what you think! As the temperature goes higher, try getting clothes that are actually loose. A flowy maxi dress will keep you cooler than a pair of shorts and a skintight tank. The less fabric that touches your body, the more comfortable you’ll feel. The loose clothing allows air to pass along the skin and exit, speeding evaporation and carrying off excess heat. So the looser, the better. One of the easiest and simplest ways to get the right summer clothes is by knowing what fabrics they’re made of. Try cotton, it’s light and breathable which makes it perfect for polos and shirts. Also, linen doesn’t retain moisture so any sweat will dry quickly. And, think about the active wear fabrics, they’re all made of synthetic blends. They can help you combat the heat while effortlessly making you look stylish. Mix and match them and you can look cool and be cool when wearing them. Shorts are a summer staple. They allow ventilation for your exposed legs and they’re great to wear in the hottest times of the year. So try getting comfortable ones made from the kind of summer fabric that works best for you. Compared to light colored clothes, dark colors absorb more light and that can make you feel hot. So whenever possible, try to stick to light colored clothes that reflect light and will keep you cool. Who say’s you need to be on the beach to wear those wide-brimmed hats when you can wear them evenin the city. They’ll protect you from too much sun and provide shade to the head and face. Not to mention, hats can effortlessly up your fashion game. So consider getting those that are made of lightweight and breathable material to offset the trapped heat. Flipflops are your feets best friends during the summer season. So why not make them more stylish and fun. All you have to do is simply wrap a ribbon first in the straps of your flips while joining them both. Then stick some beads and bells on them with a strong glue. Let them dry for few minutes and voila, fab and chic flipflops in no time. If you have a long hair like me, then we both know how annoying it is whenever it sticks to the neck. As a great solution, get a small cotton scarf and use it to tie up your hair. It will help absorb sweat and will make you feel extra cool and fashionable. To complete your summer look, try to add some accessories like jewelry. They can add a touch of glam to your look while still keeping it elegant and sophisticated. Just be sure to choose minimal ones since they can easily make feel you irritated once the temperature rises. Earrings are fine because they don’t really touch much of your skin, but necklaces, bracelets, and rings, you should skip them. As the season changes, it’s always nice to wear clothes that are stylish and comfortable throughout the warm days. And with these fashion tips and hacks, they’ll make your summer fun and exciting. So give them a try and let me know what you think. Now, if you have any questions or concerns about these summer fashion hacks, feel free to let me know in the comment down below, I’d love to help you out!